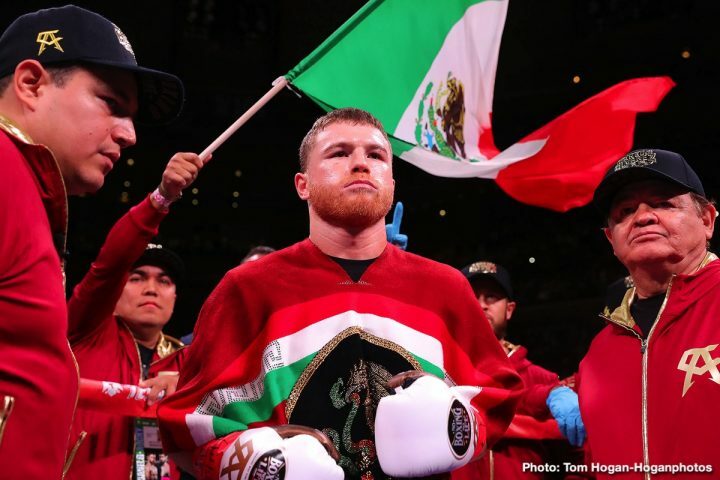 By Dan Ambrose: The odds-makers have installed WBA/WBC middleweight champion Saul Canelo Alvarez (51-1-2, 35 KOs) as a slight 2.5 to 1 favorite to defeat IBF champion Daniel Jacobs (35-2, 29 KOs) on May 4 on Cinco De Mayo on DAZN at the T-Mobile Arena in Las Vegas, Nevada. The smaller margins for the Canelo-Jacobs fight are quite a bit different from the huge 20-1 odds in favor of Canelo for his recent third round blowout victory over Rocky Fielding for their fight on December 15 at Madison Square Garden in New York. Golden Boy Promotions announcing the news this week that the Canelo vs. Jacobs fight taking place at the T-Mobile Arena in Las Nevada on May 4 has many boxing fans believing that there is no chance that Daniel can win the fight by a decision. Many of the fans feel that Jacobs can now only win if he knocks Canelo out. The reason the fans feel this was is the two controversial decisions that Canelo was involved with in his fights against Gennady Golovkin at the T-Mobile Arena in Las Vegas. In both fights, GGG appeared to do enough to get a victory over Alvarez, and in both fights, the judges failed to give him the win. Jacobs is now venturing into the same T-Mobile Arena to fight Canelo, and the only thing he can hope is he’s not on the receiving end of a controversial decision too. The 5’11 1/2″ Jacobs clearly isn’t at the same form that he was at when he was at his best in 2015, but he’s still fighting at a high enough level to be a threat to the 5’8″ Alvarez on May 4. If Jacobs has it his way, he’ll use his big height and reach advantage to box the shorter Canelo for 12 rounds to win a decision. Canelo is a counter puncher, who absolutely needs his taller, longer-armed opponents to throw power shots so that he can hit them with counter punches. When Canelo’s taller opponents jab him from long range, he can’t reach them with his counter shots due to his shorter arms. However, with the way the judges scored Canelo’s past fights where he was out-boxed from the outside by Golovkin, Erislandy Lara and Austin Trout, it puts his opponents in a position where they can’t just jab him if they want to win a decision. The judges didn’t give Golovkin, Lara and Trout victories over Canelo, even though they jabbed him from the outside and rarely were hit. Jacobs will have to slug with Canelo if he wants to win a decision, and that’s going to put him in the firing line for his counter shots. As long as Jacobs understands what he’s getting himself into in fighting Canelo on May 4, he’ll be fine, but if he’s under the illusion that he can win a decision against him by standing on the outside and jabbing him all night, he could be disappointed afterwards when the judges give the win to Canelo at the T-Mobile Arena in Las Vegas, Nevada. It’s nice that Canelo has made a big upgrade in competition. He can’t keep fighting the Rocky Fielding’s of the boxing world if he wants to make it worthwhile for DAZN to have given him such a huge 5-year, 10-fight, $365 million contract. With Canelo getting that kind of money, he should be fighting Gennady Golovkin, Dmitry Bivol, and some of the talented welterweights and light heavyweight. In other words, Canelo should be fighting the most popular guys available in his own division, and the ones nearby. A victory for Alvarez, 28, over the Matchroom Boxing promoted Jacobs will make him the IBF, WBA and WBC 160 lb champion. Canelo will hold three of the four titles at middleweight. He would only need the WBO belt hold by Demetrius ‘Boo Boo’ Andrade (27-0, 17 KOs) to make him the fully unified middleweight champion. What’s not known is whether the Golden Boy promoted Canelo will choose to fight Andrade in September of this year or if he’ll face former middleweight champion Gennady Golovkin (38-1-1, 34 KOs) at that time. With Golovkin about to turn 37-years-old on April 8, it’s imperative that Alvarez fight him soon in order to get any credit from the boxing public if he can beat him. Moreover, Canelo’s new lucrative contract with DAZN makes it crucial that he beings in the subscriptions, and the only way he does that is by fighting boxers the boxing fans want to see. That’s where Golovkin comes in. He’ll help Canelo bring in the subscribers to DAZN if Golden Boy is willing to negotiate the fight between them. The problem with Canelo beating GGG by a controversial decision last September is that is appears to have empowered Golden Boy to try and get a better deal for the trilogy fight. Since Golovkin believes he won the second fight or at least should have won, he’s not likely going to be overjoyed to take less than what he got last time. The second Canelo-GGG fight was viewed by boxing fans as either a win for GGG or a draw. For that reason, you can understand why Golovkin doesn’t want to take a lesser split than what he got last time. Jacobs has arguably been looking very shopworn since his loss to Golovkin in 2017. Jacobs has won his last three fights since then over Luis Arias, Maciej Sulecki and Sergiy Derevyanchenko, but he didn’t look good in any of those three fights. Jacobs narrowly defeated Sulecki and Derevyancenko. Without question, Jacobs fought well enough to deserve the victories in those two fights, but it was close, and not the type of performances that suggest that you would like to see from a guy that is considered the third best fighter in the middleweight division right now. Jacobs’ promoter Eddie Hearn of Matchroom Boxing believes that he’s superior to Golovkin and Canelo. Jacobs looks like he’s not even better than Jermall Charlo at this point in his career. Whether it was the damage that GGG inflicted on Jacobs that has him looking old and depleted at this point or simply him getting older is unknown. Jacobs still has his punching power, and more than enough quickness to KO Canelo if he can land some of his best shots on the chin of the Mexican star. Canelo has a way of making his opponents lessen up on the force of their shots due to all the head and upper body movement that he uses in his fights. Once Canelo gets his opponents to throw with less power, he’s able to win rounds because he’s landing with max power on his shots. It’s not that Canelo is a better puncher than the likes of Golovkin. He’s just good at getting his opponents to take the heat off their shots in order to connect. This will be Jacobs’ first fight of what he hopes will be many with DAZN. It would be in Jacobs’ best interest to give it his all in order to try and unseat Canelo. Jacobs can become a big fixture with DAZN if he can beat Canelo, and then defeat him in a rematch. Golovkin would surely follow two fights with Canelo, and Jacobs would get a chance to cement himself in as the best fighter in the 160 lb division in those three fights.